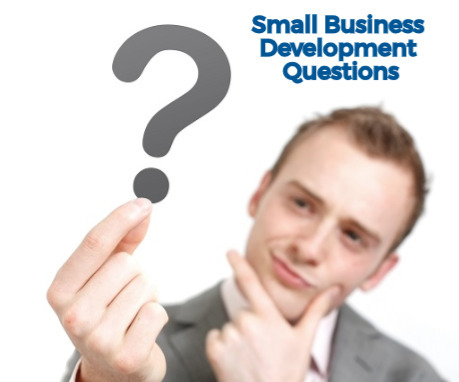 Small business development can seem daunting at times. You definitely don’t have all the answers and it can be hard to ask questions of those around you. It always pays to take the time to ask the hard questions so that you can find the best ways to cultivate your business. Whether it’s small business services, small business marketing, or small business development you are worried about, taking the time to ask a few simple questions can be the difference between moving forward and stagnating. If you are looking to further develop your small business, be honest with yourself.What is the next step for me and my business? What other aspects of this business can we develop further and/or better? Can I identify the areas we need to develop the most? Are there things about my business that should be developing quicker but are not doing so? All of these questions are a good place to start. 1. What is the next step for me and my business? When you ask yourself this question, you need to be realistic. If you choose something that is too far away on the horizon, you will never be able to develop your business quickly. Be sure to pick a goal that is simple, specific, and timely. You will more effectively develop your idea by setting a deadline and having rational expectations. 2. What other aspects of this business can we develop further and/or better? Instead of developing something from scratch, look to other areas of your business that could use a spruce up. Several quick wins may present themselves with a bit of digging. This is another way get things done rather than spending extra time and resources on a large project. There are always new ways to innovate on existing practices, processes, products, or services you offer. 3. Can I identify the areas that need the most development? Be sure to check every area of your business for development. You do not want to miss a vital aspect that needs work before moving onto a new part of your business plan or strategy. What’s currently working and what isn’t? How ae my resources distributed? Am I putting too much effort into things that don’t make me money? Cover all of your bases before making the next move. 4. Are there things about my business that should be developing quicker but are not doing so? Are there important projects or tasks that could have a positive impact on your business that are languishing? Why are they not being progressed? Is it a lack of knowledge, experience or money? Identifying bottlenecks (even if it is you) can help you to either eliminate that issue or try something different in that area of your business. By asking these simple questions, you can benefit by providing better services for your customers and informing your employees. 1. Do our services provide a solution or deliver value to our customers? You always want your service and business to provide value to your customers. This is the very essence of what creates a business – a valuable offering that is in demand and meets the needs of your target audience at a price point that is acceptable. Survey your customers to understand why they do business with you and what they see as the value in your offerings. 2. Can I define our services in a way that makes sense and is easy to understand? Again, if you cannot simply define what your service does or it is not easy to understand, you are putting your employees and customers in a bind. Do not expect your service to be understood by your clientele, you need to have a simple description of what, how, and why your service is what it is. Being clear on your uniqueness and why a prospect should choose you over the competition is both art and science. It is worth the effort to document your services key benefits and outcomes. 3. Do our customers see this service as useful? It goes without saying that the services you provide must be useful to your customers. If they are not useful you will find yourself offering something that no one wants. Whenever developing a new service or product always start with a survey of existing customers to present your MVP (Minimum Viable Product). This is a model of what your end offering could be. It is quick to create and low cost. Based on customer feedback this model is tweaked and further developed into a service that you know is going to be useful and, in most cases, successful. 4. How can we improve the benefits of this service to our customers? If a service that was originally successful seems to be declining in demand, don’t just guess why this is so. Be sure to ask your customers what else you can do to improve it. This is where most small businesses go wrong, they stick with what they know and expect that consumer’s minds and beliefs will stay on one track forever. Business and customer desires are dynamic and forever changing. If you aren’t innovating and keeping abreast of trends in the market place, you may be left behind.When in doubt (or decline), ask! Most small business owners focus on conserving resources such as time, money, and materials. These outlays can grow at an exponential rate if marketing is not managed correctly. Marketing done correctly is a strategic investment. Done incorrectly it is a major cost. The easiest way to figure out if you are marketing correctly is to ask these simple questions. 1. Are the marketing methods I am using appropriate for my business? The key to success is to use appropriate marketing methods for your specific industry. Do not expect the same comedic ad for shoes to work in your kitchen installation market. If you are not aware of what your target markets wants and desires are, your marketing will be random and ineffective. Be sure that you are focusing on your consumers needs and not yours. If not, you may find that the approach you employ may be at odds with what your customers find attractive. 2. What do my customers think of when they think of my business? The biggest and most important marketing decisions are based on what your consumer thinks. You need to think of how your customers see you, your brand, your business, and your product or service. Do not be blinded by what you or your employees see; look progressively through the eyes and experiences of your customers and you will find the answer for your marketing campaigns. Each time you ask, you will receive feedback. If you are wanting to grow your business and develop your strategies, you must be willing to ask yourself and others questions every day. You should be constantly asking questions in order to continuously develop your business throughout its lifetime. So get out there and start asking questions! Need help with finding out what your market wants? Contact Profitkoach for a free Strategy Session.